Worst part: The heavy-handed subtext. Certainly, veteran actor/writer/director Woody Allen has lived an awe-inspiring, unpredictable, and thought-provoking life. The 78-year-old Tinseltown icon has spent several decades breaking the mould. With game-changing successes in multiple disciplines, his aura, for the better part of a century, has shone brighter than Hollywood Boulevard and Times Square combined. This starry-eyed filmmaker has delivered some of cinema history’s greatest moments. In front of and behind the camera, the tick-laden auteur has given industry hopefuls and impressionists plenty to smile about. 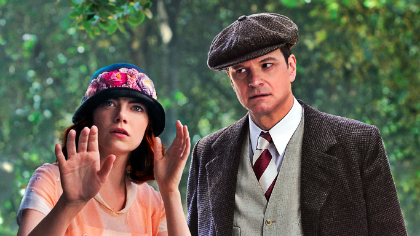 Colin Firth and Emma Stone’s peculiar coupling. Allen, despite being cinema’s most prolific hit-and-miss filmmaker, shouldn’t be insulted for his work. However, despite his merits, his latest effort, Magic in the Moonlight, won’t convert any average film-goers into raging fans. This jaunty romantic comedy, if anything, proves that Allen should take more vacations. Possibly, he should go to some of the many picturesque locations he’s captured over his illustrious career. For now, he’s stuck making witless and confused rom-coms. In typical Allen fashion, the allure of classier times fuels the otherwise bland and uninspired narrative. The story, inexplicably wafer-thin, relies on several key players to push it into overdrive. We start off in 1920s Berlin, with a world-famous illusionist performing his signature act for a packed house. Wei Ling Soo, playing to wealthy audiences, earns his fortune by making elephants disappear from boxes and slicing gorgeous stage hands in half. However, the real illusion is revealed once Soo is back-stage. Revealed to be a snide British man, Stanley (Colin Firth), Soo regularly berates production crew members, journalists, and fans. Debunking fraudulent magicians and mediums in his spare time, Stanley’s narrow-minded worldview attracts business but deters everything else. Given a new assignment by long-time friend Howard Burkan (Simon McBurney), Stanley heads to the Cote d’Azur to mingle with the ultra-wealthy Catledge family – Grace (Jacki Weaver), Brice (Hamish Linklater), Caroline (Erica Leershen), and her husband George (Jeremy Shamos) – and uncover houseguest/clairvoyant Sophie(Emma Stone) and her mother(Marcia Gey Harden)’s misgivings. The sublime sights of a Woody Allen picture. Crafting a star-studded feature every one-or-two years, Allen’s work-horse routine is now cracking under pressure. Sporting a career marred by controversy, the notorious filmmaker should be trying harder to win us over. Sadly, this lifeless and misguided rom-com is a significant step backwards. Sitting well-below recent efforts including Blue Jasmine and Match Point, Magic in the Moonlight calls Allen’s attentiveness, relevance, and tolerance levels into question. Unlike previous efforts, this movie lacks anything resembling subtlety, gravitas, originality, or charm. His signature storytelling tropes, bolstered by real-life events, overcook the movie’s tiresome screenplay. Throughout its brief run-time, as Stanley becomes bewitched by Sophie’s charms, the cliche-meter ticks over. Crafting a whimsical mystery/love story, this nostalgic rom-com shifts awkwardly between each conversation, montage, and revelation. Pulling Stanley and Sophie together with witless conversations and wide-eyed stares, Allen’s latest delivers several discomforting and interminable scenarios. In addition, the narrative makes the unwarranted leap from meet-cute-driven comedy to sweeping romance. One scene, in which Stanley and Sophie’s car breaks down in front of an observatory, almost sinks this light-hearted romp. Throwing in plot-threads, characters, and twists sporadically, Allen’s 96-minute magic trick lands with a whimper instead of a bang. 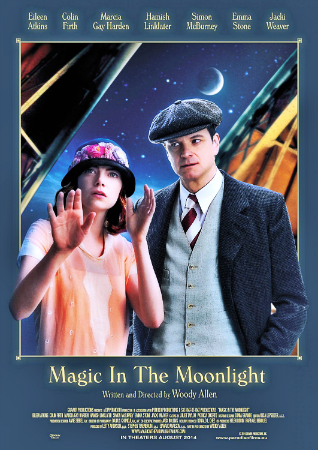 “When the heart rules the head, disaster follows.” (Stanley (Colin Firth), Magic in the Moonlight). 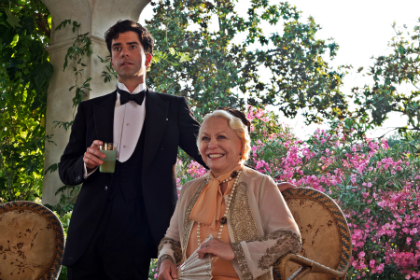 Hamish Linklater and Jacki Weaver now part of Woody Allen’s collective. Obsessed with slight-of-hand story-telling ticks, Allen’s hubris hurriedly takes over here. Sugar-coating each plot-strand and character arc, Magic in the Moonlight discards intriguing concepts in favour of stylistic flourishes and heavy-handed dialogue. Beyond the inflated narrative, the movie never says anything relevant or thought-provoking. Pitting Stanley’s nihilism against Sophie’s air-tight optimism, the movie continually dives into a suffocating science vs. religion debate. Relying on mismatched leads and one-note support, the characters exists simply to echo Allen’s viewpoints. Meddling with infidelity and age differences in relationships yet again, Allen’s personal touch amp-ups the creep factor. However, known to show off the world’s most picturesque locations, Allen’s direction bolsters this archaic and forgettable effort. Aided by Darius Khondji’s pristine cinematography, the movie’s infatuation with France is almost worth the admission cost. Drowning us in his high-society existence, his version of the Mediterranean sports the world’s most appealing vineyards, Great Gatsby-style parties, mansions, and scenic vistas. Allen should also be credited for pulling this remarkable cast together. Bolstering his exhaustive dialogue, certain scenes bow down to these immaculate thespians. Firth, despite his irritating character, admirably sells each line. Thanks to his pithy delivery and effortless charisma, the British icon elevates several sequences. Stone, however, is the movie’s best asset. Her show-stopping looks and raw energy make for an invigorating love interest. Eileen Atkins almost steals the show as Stanley’s wise and advantageous aunt, Vanessa. Whenever Allen invites a journalist into his home, he always shows off the most important part of the property. He opens a drawer, then pulls out a stack of screenplay ideas from which his features originate. This method, despite the infatuation with cinema, now seems like an act of desperation. 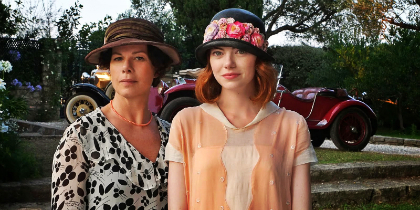 Surely, Magic in the Moonlight won’t age well. Thanks to a ridiculous screenplay, wafer-thin characters, and overbearing subtext, this fluffy rom-com highlights the veteran filmmaker’s flaws. Wearing his style thin, the movie makes for a significant misstep within a momentous career. Verdict: The master filmmaker’s latest fumble.